The time has now come for Europe to make its voice heard, after Madrid’s brutal repression and its failure to listen to that many of its own people. 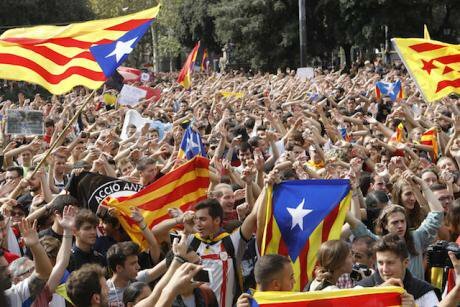 Catalan independists gather in Playa de Catalunya, Barcelona, Spain, on 2 October 2017 to celebrate the result of their referendum. NurPhoto/Press Association. All rights reserved. And now what ? What will happen on and after October 2, after the referendum organised by the autonomous Catalan government and its failed repression by the central Madrid government ? For weeks analysts, observers and media throughout Spain and Catalonia have been asking – with growing anxiety – that question while the battle between the two camps was going into crescendo. Without being able to stop this dangerous spiral. Could this work out? Is it still possible now that tensions are so high, and politicians so entrenched in their positions ? Independentists are divided between the old bourgeois, traditional centre which long ruled Catalonia, Republican historical nationalists and the leftist extremist CUP whom neither like but need to have for a majority in Parliament. It is not for us to judge who is right and who is not. There are extremists on both sides and electoral propaganda is never the best way to arrive at truth. Between 60 and 70% of Catalans have at least one grandparent born elsewhere. Catalonia is probably the only place in Europe where people have taken to the streets to get the right to welcome more refugees. This is not exactly the kind of petty chauvinism to be expected from a region wishing to portray itself as 'A country'. A lot of goodwill, patience, common sense, compromise and respect for each other will be necessary from both sides. No false hope that things could be swept under the carpet and quieten down: this is no longer possible. No counter-productive hard ball. Negotiations must be started at once, if need be with outside mediation. Delaying the process for futile political gain only gives time to the firebrands to hijack the agenda and push it towards a conflict which could be deadly. Pro-independence Catalans should avoid making irreversible decisions which could only divide their own people, such as proclaiming total and immediate independence.